Visitochsenfurt – this picturesque medieval city – but do not forget its surroundings. It is worth it! The statement that Ochsenfurt is worth a trip can also be underpinned by the fact that the city is not just a cultural heritage, but rather embedded in a historically grown, sacred and cultural exceptional versatile region. 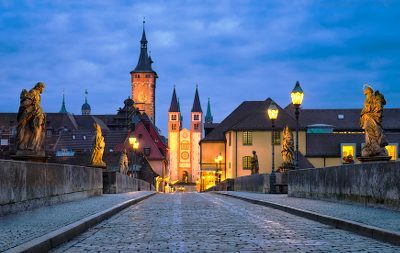 In the surrounding area, tourist highlights such as Würzburg or Rothenburg ob der Tauber await your visit. Or some true jewels like the little spot Sommerhausen. That Ochsenfurt can not keep up with a city like Würzburg with her UNESCO world cultural heritage (the “Residenz” in Würzburg) is clear. Würzburg offers something that Ochsenfurt can not offer. Similarly, however, it is reversed. 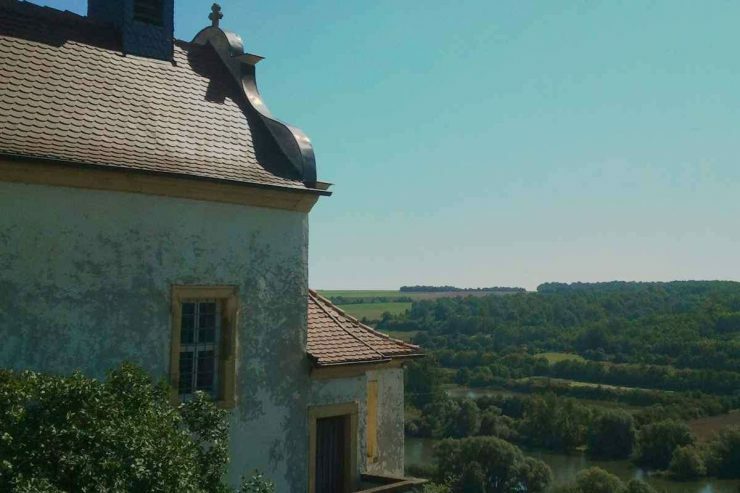 So why not take Ochsenfurt as a starting point to discover the Franconian Middle Ages, to experience wine culture, and to experience Franconian lifestyle? With Ochsenfurt one of the oldest cities on the Main awaits you. The whole – and this in comparison to Würzburg – in a very compact manner. In the Old Town of Ochsenfurt, you are invited to experience medieval flair. An ancient church whose history goes back to the ninth century and was consecrated in its present form in the 13th century. That such an old house of prayer has remarkable art treasures is almost self-evident. The gothic town hall with its bells offering a little play every full hour easily deserve the attention of its visitors. City walls, ancient towers and city gates – just stroll along the city moat, you will see! Ochsenfurt is situated in a outstanding cultural region. In the widest sense, the area around ​​the river main between Bamberg, Würzburg and Aschaffenburg describes the region “Mainfranken”. With Ochsenfurt in the middle. Already the early Franconian kings and emperors used the Main as a development axis to the east of their empire. This is also connected with the establishment of the Catholic bishoprics of Würzburg (8th century) and Bamberg (11th century) by means of which Christianization in the region should also be strengthened. This applies, in particular, to the early establishment of the diocese of Würzburg. 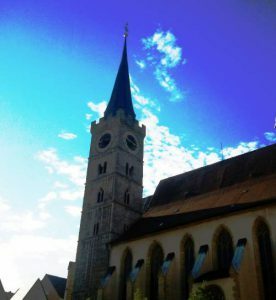 Both Würzburg and Bamberg have a unique, Franconian and sacred heritage. This can be seen already in the status “World Cultural Heritage”, which was awarded by the UNESCO to the Würzburg Residenz and the Old Town of Bamberg. A bit out of the way and not (!) To Mainfranken counting, lies Rothenburg ob der Tauber. The truely world-famous city is situated about 40 km south of Ochsenfurt in the district of Mittelfranken. Rothenburg is today visited by heirs of tourists from all over the world. No wonder: nowhere else can you find such a density of medieval buildings, which are preserved in their origin. If you want to discover, feel and taste the region of Mainfranken, you should not only pay attention to the big player of the region. If you want to experience the Franconian flair, Franconian cuisine and lifestyle along with medieval history and architecture, you should definitely go to the smaller cities. Ochsenfurt has a population of 8,000. The special appeal of the medieval town of Ochsenfurt has already been clarified elsewhere. However, Ochsenfurt can also be regarded as an ideal starting point for discovering the region. The general location, the connection over a network of important roads, bicycle paths, the Main waterway and overnight accomodations from big to small – everything available. A day trip is definitely also worth Volkach. Volkach is situated on a natural loop of the river Main, the “Mainschleife”. The city of a similar size to Ochsenfurt looks back on perhaps the longest tradition of viticulture in the region. If you want to experience Franconian viticulture in the truest sense of the word, Volkach serves best. The small town is literally surrounded by viticulture. Small enough, but not less, is Sommerhausen. 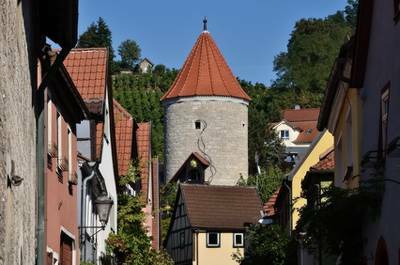 Sommerhausen is located in the immediate vicinity of Ochsenfurt, just 8 km away, along the river Main towards Würzburg. How to describe this place? Perhaps it is the adjective “romantic” that fits best. Sommerhausen must be seen. It is ideal to ride the bike along the River Main to get here. When you arrived you should expect nothing great. Rather, one should go along the small roads of the village to get a sort of special impression. In addition to inns and surprisingly high-priced hotels many galleries reside here. Even a very little theater exists, the “Tortum” theater in which Heinz Rühmann has already shot. More is not to be betrayed at this point. Just look at it! Slightly diagonally opposite to Ochsenfurt, there is the small village Frickenhausen with a little over a thousand inhabitants. Frickenhausen is not only to be mentioned here, since it is almost within walking distance from Ochsenfurt. Rather, Frickenhausen can also be viewed as archetypically for the region. From the first documentary mention, the spot was virtually inseparable from wine growing. In town visitors can experience medieval half-timbered buildings, city gates and churches, or a chapel, which would otherwise not be expected in such a small place. The vineyards, however, and the long history of this place make it possible. Today, Frickenhausen offers mainly pure wine culture. Perhaps as a visitor you simply make your way to the nearby Valentinskapelle in the middle of the vineyards. From there you have a wonderful view over the wine landscape from Marktbreit to Ochsenfurt and, of course, Frickenhausen itself. Treat yourself to a glass of Frankenwein, perhaps also in the middle of August, if one of the most beautiful and popular wine festivals in Mainfranken is held here!